Motueka is the nearest town to the Abel Tasman. Stay here and make day trips to the park or stock up on provisions before travelling on. 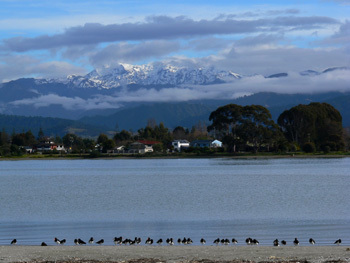 Motueka is a scenic, leisurely 40 minute drive from Nelson airport. It is a lovely town set by the sea with the Mt Arthur range of the Kahurangi National Park behind. Traditionally an agriculture town and still the only region in New Zealand to grow hops, Motueka offers its visitors an enjoyable base to explore the Tasman region from. Its central shopping area has all you need to equip yourself for New Zealand's great outdoors. Outdoor equipment shops and two supermarkets mean you'll be well provisioned before you go. Accommodation ranging from campsites and backpackers through to luxury holiday homes mean you'll be well rested before starting on your adventures. And Motueka itself offers everything from stunt flying and golf to cafés and cinemas. 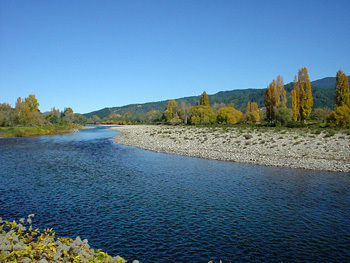 The Motueka River is world renowned as a trout fishery, so why not try some fly fishing while you're here? Or enjoy the many galleries, perusing the local artists works - we have galleries displaying everything from hand made furniture to beautiful paintings. Wander through the local museum to catch up on some of Motueka's history and if here on a Sunday make sure you visit the Motueka Sunday morning market, for local foods and arts and crafts. Many tour operators offer free transport from Motueka to their activities, so stay in Motueka and enjoy the comfort of a this friendly town. To provide feedback, suggestions, news of events or images etc please email us.